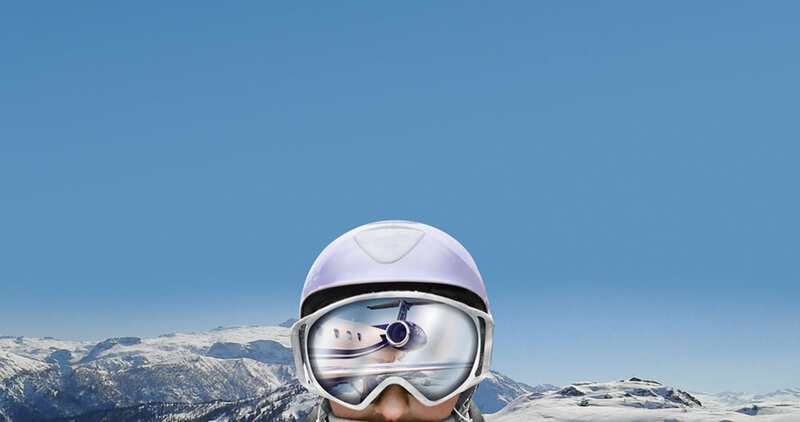 As soon as one of our JetCard members requests to book their ski trip with Air Partner, our team of Account Managers always start exploring above and beyond the request, planning for any and every eventuality. We have learnt over the last 5 decades that factors such as slot restrictions, service levels and even weather can require last minute changes. By covering all of these bases early on in the booking process, we are able to ensure a smooth and calm experience on the day of travel. As we delve into the Alpine region, we will explore the best airports that are usually recommended for each area or region, not just by Air Partner but also by our expert crews who are responsible for the safe and successful delivery of each and every service we pride ourselves upon. We have selected our recommended airport for each area, as well as the airports we would consider for a back-up in the planning process. We hope this gives you an insight into the extensive planning that goes into every Air Partner flight you take to ensure a seamless journey to your final destination, regardless of any disruption. By far the most popular request we receive every year, Chambery offers easy access to the popular resort of Courchevel. The airport itself is heavily slot restricted and many requests go ‘on request’ until nearer the date of flight. Although early booking places you closer to the front of the queue, it is sometimes not until a few weeks prior to flight when the airport authority can confirm our exact slot at this popular airport. As the facilities have to handle a mix of private and commercial traffic it can often be susceptible to Air Traffic Control delays and therefore arriving in good time for your flight is vital. Whilst the airport is open into the evening (around 9pm local time), only certain crew (with special training) can go there during the hours of darkness. We recommend early booking to secure one of these approved crew members. The airport has one usable runway and is always approached from the North. As with many Alpine airports, this airfield is heavily weather dependant but the one directional approach adds further complication. Due to aircraft having to land ‘into’ the wind direction, even with a clear, sunny day should the tailwind be too strong this can mean crews are unable to land safely. As safety is always our priority, the Air Partner team will launch our back up plans to ensure you reach your destination with as little disruption as possible. Grenoble adds approximately 40 minutes to the usual drive time from Courchevel. However given the airport is less slot restricted, less weather dependant and also widely available for night time flying, it is often overlooked in favour of Chambery. For some members the perceived inconvenience of a 40 minute drive on the map is outweighed by a far more operationally stable service and added peace of mind on the day. Lyon Bron is equidistant to Courchevel versus Grenoble. However, this smaller ‘sister’ airport to the main Lyon St Exupery is dedicated in its quest to be the main service offering for private aviation. Unlike Chambery and Grenoble is offers a more exclusive service and is worthy of consideration. With Sion the airport of entry for both Zermatt and Verbier it is our second most requested airport after Chambery. The airport is dedicated to private aviation and therefore offers exclusive service and the utmost convenience. Geographically, Sion Airport is located at the bottom of a deep valley surrounded by steep mountains either side. The airport is considered ‘VFR’ meaning visual flight rules apply and the crew have to fly by sight. Whilst it can appear a fine day from your Chalet or even the terminal building the crew have to fly at low level along the valley to meet the required approach pattern. Any low cloud along this route can make it difficult to descend below the mountain tops and occasionally require us to use an alternative airport. In addition to this, the airport is available during daylight only and can often be busy during peak times, but it is not generally an issue with regards to securing a fixed slot for arrival or departure. A good alternative to Sion and also an airport of entry for those wishing to access resorts such as Megeve with larger jets unable to land safely at Annecy. A major international hub that has one of the most restricted runways in terms of required slot permission that can only be granted by the airport authority. Like Chambery, slots are on request and are allocated 5 days in advance. The airport have invested in an online slot coordination tool which Air Partner Plc have direct access to. This means that your Account Manager can view the available slots for short notice flights. Being a large airport it offers our crews full instrument landing capabilities, meaning bad weather rarely causes a closure although severe icing did occur on a handful of days last year. Private traffic is handled in a separate VIP facility known as the ‘C3 Terminal’. With Air Partner’s JetCard offering free cancellation until 0700 local time the day prior to departure we recommend booking your Geneva schedule in advance and then simply cancelling your slots with us if your plans change. For decades, St Moritz has offered the glitz and glamour associated with the finest in Alpine adventures. Samedan airport is dedicated to the world of private aviation and offers quick access to St Moritz in under 10 minutes. Much like Sion its convenience is coupled with the understanding that all crew must make a visual approach and it is therefore very much weather dependant. In addition the airport is only available for daylight flying. Unfortunately Samedan (for St Moritz) is not well located in case of diversions. Altenrhein may offer a private service much like Samedan but with a drive time of over 2 hours to St Moritz we appreciate the inconvenience that this can have on your day. In order to smooth the process your JetCard price includes the extension fee required to keep Altenrhein airport open when others would not be able or willing to fly there. With one of the few airports that still closes for a lunch break, the fee to keep the handling agent working on your behalf is covered by Air Partner. As a rule of thumb, following these simple tips will help us manage the technically challenging scenario of winter flying to deliver the best travel experience with JetCard. Try not to schedule arrival or departure within 1 hour of airport closing times (Air Partner can advise depending on the time of sunrise or sunset). Keep Air Partner’s 24 hour Operations team’s details saved in your phone ops@airpartner.com / +44 1293 844 888. Our experts are on hand to interpret weather forecasts and advise you accordingly. Consider that Alpine airports do not publish aviation weather until they have been open for at least 20-30 minutes. Until this time we have to do our best to interpret likely weather patterns using nearby International gateways. Always tell your Account Manager which resort you are trying to get to so that we can check that you have the best airport in mind. Pass details of your chauffeur company or chalet manager to Air Partner so that we can coordinate your arrival and departure appropriately. If you are flying with skis, snowboards, boot bags or helmets please tell your Account Manager so that all your valued equipment can travel with you. If you fancy high calorie in-flight catering please speak with the Air Partner team so that we can ensure you are fuelled ready for your arrival on the slopes. Finally, please bear in mind that mountainous weather can change quickly and is sometimes unpredictable. We will take all endeavours to make sure you are advised accurately, however in the circumstance of unforeseen weather disruption, we cannot make any guarantees where our primary responsibility has to be to ensure your safety at all times. RAF Northolt have made public their intention to carry out essential runway works in 2019. As the work has already been deferred by one year it is now important for them to ensure the maintenance is complete. Whilst we don’t have confirmed dates for the work, we expect that it will commence from Mid April 2019 and last for approximately 6 months. During this time the airport will be closed to all civilian jets. Your Account Manager will be on hand to advise the best alternative airport for your journey. We would recommend using Farnborough for any West London departures and booking early to avoid disappointment.